My interest in lightweight lead aprons is to find something I can use to block DEW even when I leave my home. Currently, I recommend to TI’s a dental apron for blocking DEW (directed energy weapons); the apron works great. However it is large and cumbersome; you cannot wear it outdoors without looking unusual. I wanted a vest I could wear under my clothes when I go out; and one I could wear around the home without it getting in the way (ie: when I’m cooking in the kitchen). The dental apron swings around and is bulky. I recently received in the mail the lead apron I ordered from Xenolite. I must admit I was pretty excited when it showed up! Xenolite uses a special lightweight lead rubber material in its lead aprons. The Xenolite frontal aprons weigh only 5 pounds (this compares with about 10 lbs for traditional frontal lead aprons). I special ordered this apron; usually the aprons go to your knees but I called Xenolite to cut it off at my waist (giving them my dimensions) and they obliged (which was very much appreciated!). What this means is that the vest covers my torso, my chest, all my vital organs, but it does not spill over below my waist such that it would show in public. Which is what I wanted. 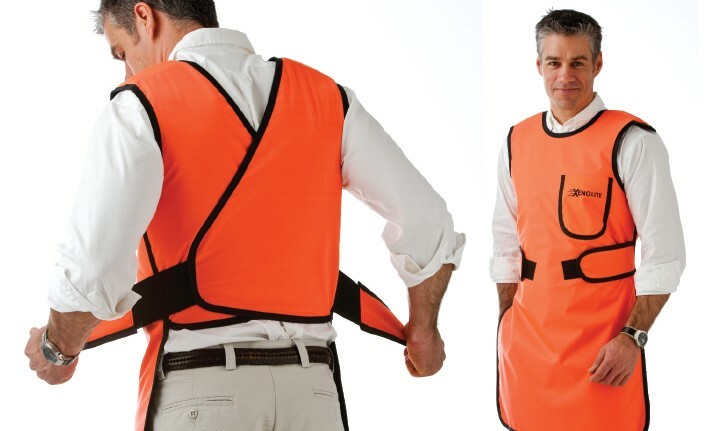 Here is the model I ordered- 600B Elastic Tab Apron. I ordered a black version (so it would blend in with my attire such as a black shirt underneath my collared shirt). Also I custom ordered it, as mentioned, so it would end at my waist (at my belt buckle) so that my shirt could go over it and completely cover it- so I can use it in public. This is the lead version of the apron. Although they have lighter non-lead versions which they claim provide as much protection as non-lead, I have field experience that lead blocks perp EMF attacks whereas I don’t know whether that’s the case with non-lead options (bear in mind lead & non-lead medical aprons are designed to block ionizing high frequency radiation such as from x-rays whereas the frequencies we are interested in blocking as TI’s is RF radiation- which is much lower frequency. Because of this, the brand saying that non-lead works the same as lead may not apply in our case even if it does apply for high-frequency ionizing radiation). Also a reminder- this is a frontal-apron only- it does not provide protection for the back. Wow, this is cool. I mentioned the Elastic Tab Xenolite apron is 5 lbs; that is its listed weight. However recall that I ordered a smaller, custom version that excludes the portion below the waist. Because of this my apron feels about 4 lbs. It is also really well designed- so that the weight load is distributed across my body. The apron claims “Body hugging design shifts weight from shoulders to waist”; and it does seem to be the case. The weight is shifted throughout the body and doesn’t seem a burden. It ended at my waist. It is VERY thin. It provides 0.35mm lead protection (the dental apron provides 0.3 mm lead protection). It fits snug with two velcro straps. Because of its thin profile, I was easily able to put a collared shirt over it. And I then I went out into public to grab lunch. Looking at myself in the mirror; I could not see the apron! So finally I had body shielding I could wear not just at in the comfort and privacy of my home but outside as well. Walking with it was easy; unlike the dental apron, it stayed in place, close to my body and not waving around. Two minor things. One, the apron does push out a bit and if you are wearing a thin shirt over it, its blocky form may be visible as it pushes up against the shirt. In my case, I wore a thick collared shirt (more of a sweatshirt material) in which case, the protrusion was less visible. Some unevenness in the front of my shirt but nothing that stood out. When I sat down however, the apron bunched up a little bit and altered the appearance of the front of my shirt a bit. Not a huge deal but if you were to make a first impression or go on an interview, it may be something to bear in mind. Second, the waist is a bit tight. When I sit, it squeezes my stomach a bit and I need to unvelcro the straps. Because of the velcro mechanism, there is no easy way to make a small adjustment and loosen it; you need to pull off the tabs and reaffix them. I will discuss with Xenolite and see if there’s some solution. (Update: I re-ordered another vest and requested longer tabs; you can get the tabs 3 inches longer or so and this will allow you to wear the vest without it being so tight; this provides some “give” on the velcro mechanism). One of the things about being a TI is you are hit with so much, so many different campaigns and attacks, that you sometimes never quite know what is bothering you. For years I had an unwell feeling, esp. when walking around. I felt like discomfort in my stomach and generalized fatigue. I retreated from the outside world. Or could only be out of my home so long before an unspecific fatigue forced me to come home. I thought it could be a million things; mostly GI medical conditions. I did not suspect it was subtle TI targeting (despite being hit with other things TI’s are hit with: acoustic attacks, sharp DEW, gangstalking). As I used my apron at home, and saw the difference, I began to think- maybe it is a subtle kind of DEW that is making me ill when I’m outside my home. Sure enough- that seems to be the case. I felt normal for the first time in a long while walking the streets in my neighborhood. I didn’t feel that strange unwellness; the kind that brings me down, low-energy, and a queasiness from my stomach. I felt confident and undeterred. Which tells me that my suspicions were correct. Unlike at home, when you are outside, there is often no physical barrier between you and the EMF projecting satellite; it’s often a straight shot hitting you with Directed Energy. Microwave torture is simplified. Wearing the Xenolite light apron made a big difference. I only had leg fatigue as they were unprotected . I can see myself wearing this regularly. I am now of the belief that they target TI’s even more so when you’re out of your home; perhaps to deter you from productive activity like work and social activity. I strongly recommend TI’s, if you feel discomfort when you leave your home, and you think it may be subtle DEW, consider a lightweight apron. I wanted to share my initial impressions. I will keep gauging how it goes. One thing I did notice; I was being targeted even when I got a foot massage; a few minutes after walking to the foot massage, having taken my apron off, I began to feel significant stomach discomfort. When I put the apron over my mid-section during the massage, it went away. (and for all those “science deniers” that rely on soft science to convince themselves “it’s all in one’s head”, I strongly advise you read some hard science, as in physics, on microwave frequencies and their ability to impact human tissue). However- there were two times when there was a sharp pain that seemed to go through the apron. When I double up the apron (folded it on itself) to cover that area, the pain went away. The Xenolite apron says it provides 0.35 mm pb protection which is greater than the Flow dental apron (at 0.3 mm); but interestingly I never seem to have any DEW that gets through the Flow apron. So I will keep comparing the two. To be fair, I never wore Flow outside my home. And I live in an apartment building- so going to a single story massage versus living in the middle of a multi-story apt. building may allow stronger DEW than at home. Having purchased a Trifield EMF meter and found irregularities at times at my home, I may also check the EMF levels when I go outside. At the moment I get the impression that the Xenolite frontal apron will be an important part of my shielding armor wardrobe and will give me more freedom as I seek to live the most normal life possible under the circumstances of being a TI.